Its a Wonderful Movie - Your Guide to Family and Christmas Movies on TV: Congratulations to Hallmark's 2018 Merry Madness Winner "When Calls the Heart: The Christmas Wishing Tree"
Congratulations to Hallmark's 2018 Merry Madness Winner "When Calls the Heart: The Christmas Wishing Tree"
I am so thrilled to share... "When Calls the Heart," for the second year in a row, was in the championship round of Hallmark Channel's Merry Madness Bracket... and this year... they won!!! 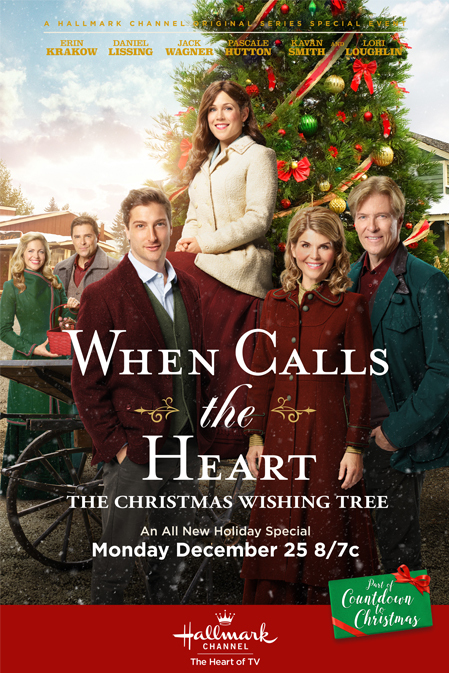 Congratulations to the cast, crew, and writers of "When Calls the Heart," I'm continually amazed and captivated by your heartwarming stories, and I'm truly so happy to know many of you viewers feel the same. It gives me great "hope" for our world today, that this one show, about faith, family, friends, community, and love has such great, overwhelming support. UPDATE: It was previously announced that the bracket winner movie would re-air Friday night; instead, the Hallmark Channel will be playing on Friday a Merry Madness Movie Marathon with "A Very Merry Mix Up," "A Royal Christmas," "A December Bride," and Switched for Christmas." Unfortunately, it seems they will not be replaying the WCTH Christmas special, after all. It will be fun to have this Christmas movie marathon in April, but I am disappointed WCTH will not be played. At my home, we had a lovely snowfall on Easter (in the Midwest), so this couldn't have come at a better time for us, as it feels more like Winter, than Spring! What is your weather like, where you live? Are you excited to have a Christmas movie play on TV in April? Was "When Calls the Heart" your bracket pick? I must admit, it was one of the movies at the top of my bracket, and I'm very happy WCTH won this year! Please share your thoughts in comments below! Congrats, once again, to WCTH and all the Hearties! I'm a very happy Heartie today, Net! This is the best news to get on a Monday, now we get to watch WCTH twice this week. This is heaven on earth! Unfortunately, as I'm sure you've heard, the WCTH Christmas movie won't be re-airing Friday night, after all. I know many Hearties are disappointed. I'm not sure why it didn't work out... must be due to contracts and legal rights. Congrats to WCTH! We did it, Hearties! I can't wait to watch it again Friday night! It was my pick for overall winner! Oh, I wish it was playing, as was previously announced, but WCTH is, unfortunately, not being played Friday night. It still won the bracket, but it's not airing during the Merry Madness Movie Marathon. WCTH is my absolute favorite show that teaches us love, hope, faith and community in a world that's in shambles and it brings a fan base together to share the love of HopeValley. Thank you all who have created and the cast who bring their all to touch our hearts. Hearties knew that the Christmas Wishing Tree would win hands down. Can't wait til Friday to watch it again. Not my pick, loved the movie though. My pick was "A Season for Miracles". The movie is almost 20 years old but stands the test of time. "A Season for Miracles" was one of my top round picks, too! I so agree... even all these years later, I still love it! I love love having a Christmas movie play in April. Just like last year it is so great. It's one of those little nuggets that I look forward to now, even in January, when I am bummed by Christmas season being over. It's fun again now. It's a new Christmas year and it's already begun. Being a regular visitor of IAWM has changed my whole perspective on Christmas now. Because of this place, it truly is Christmas all year long now. I also had "When Calls the Heart" on one of my brackets. Going to be so much fun seeing it on this Friday. I'm still watching Christmas movies occasionally. Was disappointed there wouldn't be any Christmas in July this year but glad to know Hallmark is working overtime at producing more good movies for our viewing pleasure this year. Debbie, I love watching Christmas movies all year round, too, and you will be happy to know Christmas in July is still happening on the Hallmark Channel and Hallmark Movies & Mysteries! The only difference is, this year there won't be any new Christmas movies in July, but we'll still have many past favorites to enjoy! I am super excited we will get 4 christmas movies friday yay!!!!! My Winner! ❤ Where I live it is normal Spring weather, early summer or summer temps to the rest of you. Still, I will miss Christmas in July as it always broke up the long lazy days, and long brutally hot months. Will be setting my DVD on Friday, and might save for July. Christmas in July is not going anywhere. The dates for the event have already been announced (though they could always change). The only difference about Christmas in July right now is that, according to Entertainment Weekly, Hallmark supposedly has no plans to premiere NEW movies in July (in July of 2015, 2016 and 2017, there were Christmas movies premieres). That information could change, as it is still very early and Hallmark could decide to premiere new movies by the time July gets here. There will be Christmas in July, just no new movies from Hallmark at this moment. Another good one! Looking forward to the third one in the series, "Marrying Father Christmas," this Christmas season! My birthday was wonderful. Thank you, RG, so much... I was truly blessed...God is so good! I had WCTH as the winner...but unfortunately I only did so-so with my other picks leading up to it. Still, it was lots of fun to play, and this year I didn't have any "whaaaaaat??!" moments where I'm thinking, "How did that one win??"! Great bracket pick, Mark! It was hard to choose on some of the match-ups... with so many great options! Glad you picked the winner! Wonder if there are other prizes, for those whose bracket isn't perfect, but close? Yayyy When Calls The Heart! Very well deserved! So obsessed with this series! Great news for WCTH; best show, best cast and I hope It will be around for a long time to come!! We're still cleaning up after all those storms this past month. Lot's of roof and siding damage throughout our community and many beautiful trees of all sizes have been uprooted. To top it all off; we're expecting rain, sleet and snow this Friday and Saturday....Oh, my gosh, I'm ready for Spring, Net!! Yes, that's wonderful news for WCTH, but I'm terribly sorry to hear you had such awful storms go through your area, Linda. I hope it was structural damage that can be repaired in time and no one was hurt. It's always sad to lose our beautiful trees, too, that have taken so long to grow. We had downpours of rain yesterday... April Showers!!! .... and we're expecting more accumulating snow, as well, this weekend! Spring Fever will end on Hallmark, and it hasn't even felt like Spring here, yet!!! Thank you, Net, I pray continually for divine protection for all. We had no damage to our home but lost 12' of our privacy fence. Thankfully it has been replaced already but many in our community are still waiting for adjusters to evaluated their damage. Seems like this will be an ongoing, long process but, thank God, we are all safe.